I don't know that I have a "great" sea glass story. I did that little survey about the site. I now know what my own frustration is... and probably my own fault. I'm never quite sure where I should post. But here goes anyway. I live in Connecticut. It's supposed to be winter here. But we, my cousin and I, enjoyed about 5 hours at a nearby beach collecting sea glass, relaxing and enjoying a beautiful, sunny and warm February, 64 degree day. I even took my light weight jacket off and tied it around my waist! In February! In Connecticut!! Crazy! We've ventured out several times over the winter. The nice thing is that this beach, Seaside Park, is about a 10 min. drive! It's a large area, but we concentrate mostly on 1 long stretch of beach. The main beach where regular beach goers gather in the summer is flanked by 2 smaller 'beaches' that aren't conducive to sun bathing or swimming, but are definitely very conducive to sea glass collecting. But at times, we've also been quite successful on that main beach. We hit all 3 yesterday, but spent the majority of our time at our favorite and most sea glass lucrative beach to the left. If we're not watching the tide coming back in, there are many very large boulders leading up to an upper sidewalk were we could make our escape. There were a number of sea glass collectors wandering about. It's always nice to meet these like minded people and share some of our finds of the day. I filled a large zip bag with glass. I only stopped, initially intending to make one more pass along the main beach, because my shoulder bag that I carry the zip baggie in was just too heavy and hurting my shoulder and back. I found a great selection of colors and shapes. But my find of the day? Was from that little area to the other side of the main beach which with hit first. 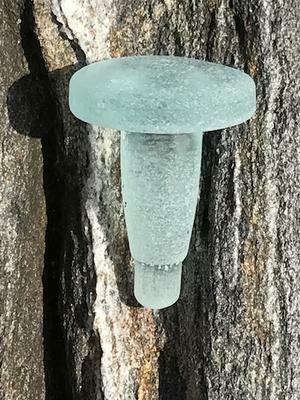 About 10 minutes into our sea glass hunt, I found a beautiful turquoise, frosted bottle stopper. It was fun sharing my find with other sea glass collectors. The few unusual pieces likes this that I have, I found at this section of beaches. I have a frosted glass perfume bottle top in beautiful shades of blues, and a large, thick bottle stopper and now this lovely piece. Behold! Glad you found this unusual stopper. The bottom part of it is very unique. I have a nice collection of them from New Haven and none have that extension piece on them. My first stopper was from Seaside 2 years ago but it was cracked and not frosted. Hope to see you at the beach again someday. Gorgeous! I love meeting new sea glass collectors.